Have you ever gone for a walk in the woods or played in the tall grass and found a little insect embedded in your skin? If so, you may have been the host to a parasitic insect called Ixodes scapularis. The species Ixodes scapularis goes by many common names you might be more familiar with such as; deer tick, bear tick, and blacklegged tick. 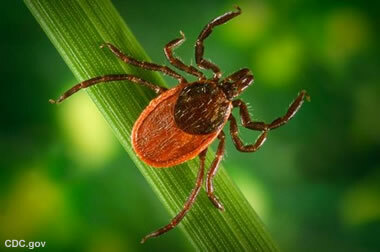 The deer tick is the primary vector of Lyme disease in the United States. Their life cycle consists of four stages-- egg, larval, nymph, and adult. Within the four stages the deer tick feeds three times and considered to be a three host parasite. The variety of hosts for the deer tick ranges from mice, birds, reptiles, to larger mammals such as deer and humans.